The Germanic tribes who settled in Britain from the 5th century onward, commonly known as the Anglo-Saxons, were a bellicose people. They put great stock in battle-prowess and dying in combat in the service of one's lord was the ideal death of a warrior. They were a people of tales and sagas told around hearth-fires in smoky halls. The story of Beowulf, a great warlord who later becomes a great king, harkens from sometime during this period. The eponymous character of the epic poem is typical of heroes of the time. He is brave, strong, honourable and his fame is known throughout the lands in which he travels. Warriors such as Beowulf measured their battle-fame and success in the quality of their weapons and armour. 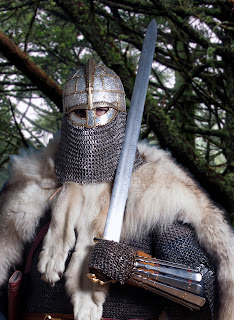 The Saxons are even named for their use of the single-edged knife or short sword called the seax. The period from the end of the Roman presence in Britain to the Norman Conquest is now known as the early medieval. However, it is more romantically, and much more commonly, known as the Dark Ages, and in many ways these centuries were dark. Literacy and education was very rare, so much of the history was not recorded in writing. As to remains for archaeologists to study, the Anglo-Saxons built their halls and houses of timber, leaving little in the way of visible marks on the landscape. The times were dark indeed for many who perished in the frequent bloody battles between the small kingdoms that divided Britain. However, it was not all gloom and death. It was also a time of great craftsmen, who created some incredibly intricate work. 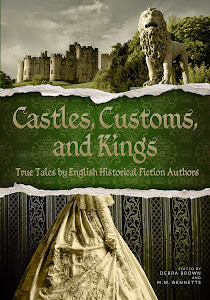 Nowhere was this more apparent than when their love of war melded with their sense of the artistic in the creation of their sword blades and the ornate decorations that adorned their pommels and hilts. 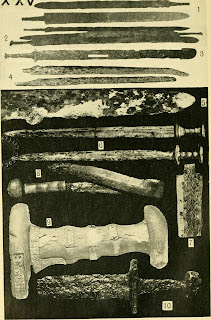 The Anglo-Saxons' skill in forging pattern welded blades was second to none. The discovery of the Bamburgh sword and the Staffordshire Hoard show the incredible workmanship that these craftsmen from the so-called Dark Ages were capable of. The best quality sword blades of the time were made using the forging technique that we now know as pattern welding. Pattern welding involves forging together alternating twisted rods. 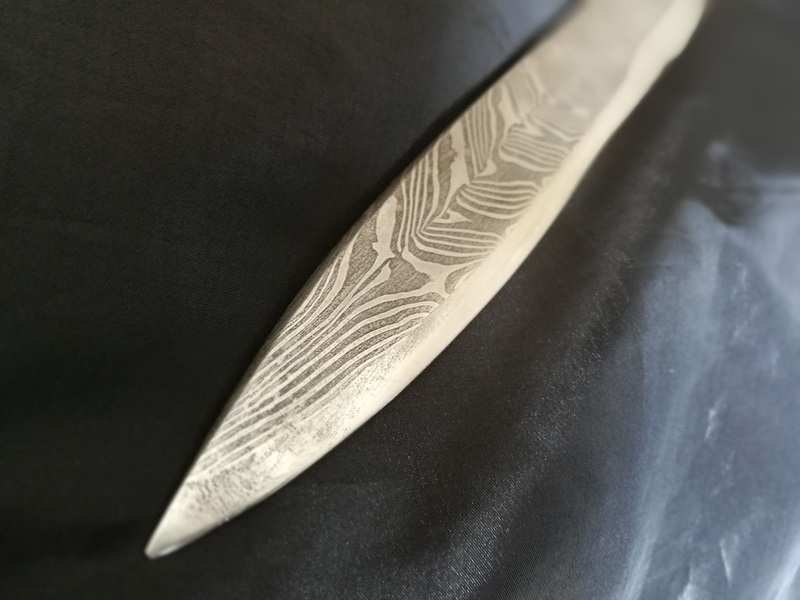 These rods form complex patterns when forged into a blade. During the Anglo-Saxon period, sword manufacture reached a level where thin layers of steel were overlaid onto a soft iron core. This made the swords flexible with a springy strength that would prevent the blade bending or snapping in combat. 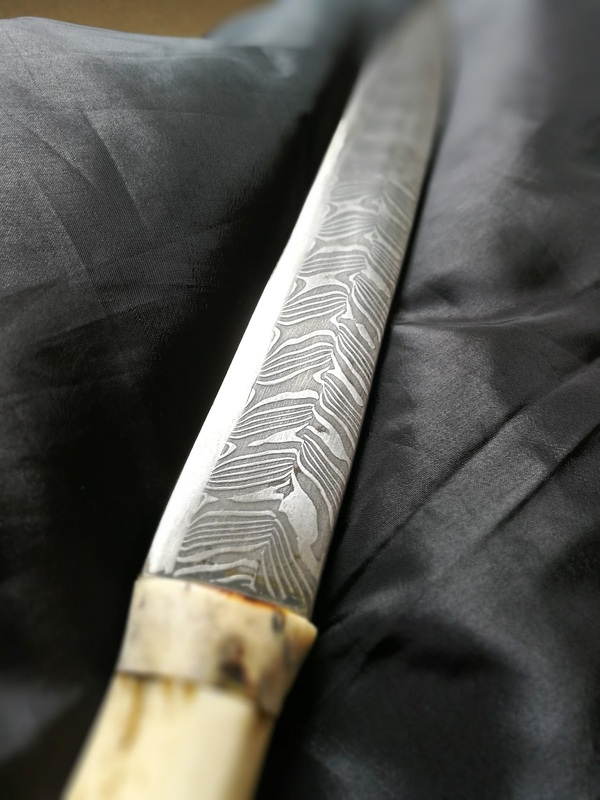 The most sought after blades had pattern welding forged around an iron core. Not only were these blades coveted due to their qualities, they were also things of beauty in their own right. One sword was described in Beowulf as "the woven snake-blade" and "marked with venom-stripes". It is likely that these descriptions came from the scop putting into words the fabulous, striped markings on the best pattern-welded blades. Such blades would have been like the sports cars of their day, admired by many, owned by few. Both functional and beautiful, these incredible weapons were status symbols of kings, warlords and the richest of household warriors. One such fabulous pattern-welded sword is the Bamburgh Sword. It was discovered at Bamburgh Castle in 1960 by Brian Hope-Taylor, who failed to identify it. It was only forty years later, following Dr Hope-Taylor's death, that a student found the blade in a suitcase that was going to be sent to landfill! Luckily it was not destroyed, and subsequent studies of the blade showed it to be a unique seventh century sword made up of six separate strands of iron. No other sword has been found from the period with more than four rods in a pattern welded blade. 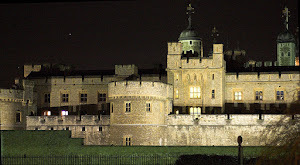 It must have been fabulously valuable, perhaps even owned by a king. It is now on display at Bamburgh Castle, along with a replica of what it would have looked like when it was new. The swords of noble warriors did not only have fine blades, their hilts were adorned with gold and garnet pommel caps, golden rings, and all manner of scroll work and runes. Nowhere can the quality of these items be seen more clearly or in greater quantity than in the huge number of pieces discovered in the Staffordshire Hoard. Discovered by a metal detectorist in 2009 near Lichfield, it is the largest hoard of Anglo-Saxon gold and silver metalwork found to date, with a total of 5.1 kg of gold, 1.4 kg of silver and around 3,500 pieces of garnet cloisonné jewellery. 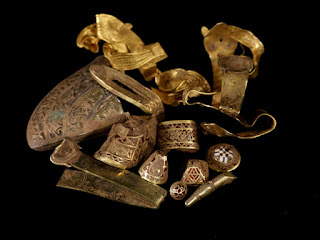 The hoard was most likely deposited sometime in the 8th century, though the exact date or indeed why such riches were abandoned, can only be speculated upon. However, many of the items were stripped from fine weapons, attesting perhaps to the hoard being spoils of war, or maybe payment from a defeated force containing many wealthy warriors of high standing. The level of detail on the items is really astounding, and shows that weapons were clearly status symbols in their own right and not merely tools for dealing death. Another way we can see the importance of weapons to the Anglo-Saxons is by the objects they buried with their dead. 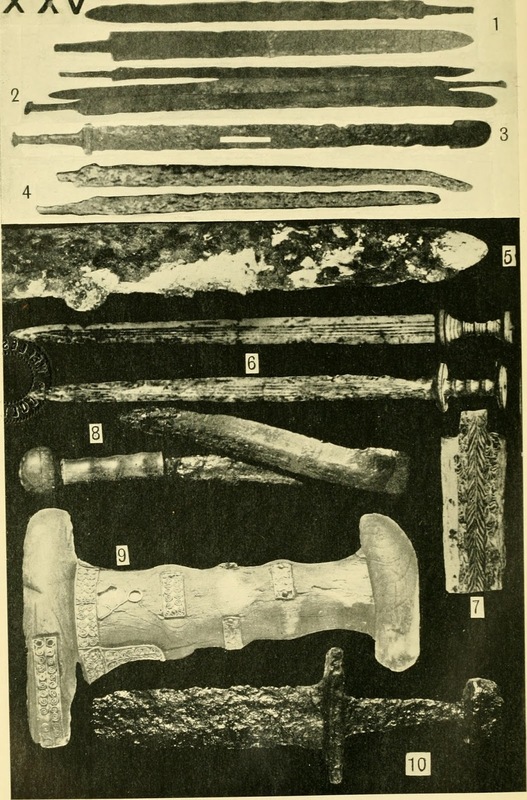 Before Christianity took a firm hold on the Anglo-Saxon kingdoms, men were often interred with swords, shields, spears and seaxes, not to mention other items that presumably they would have found useful in the afterlife. 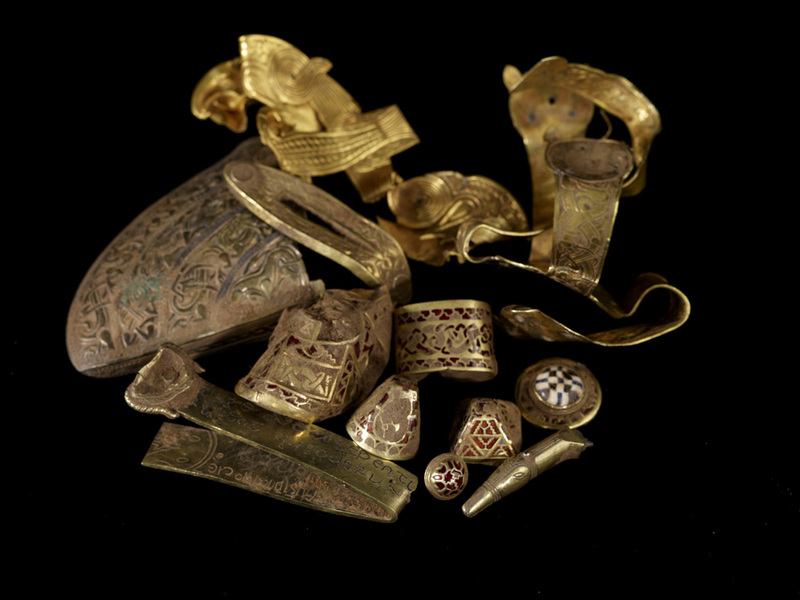 Later in the Anglo-Saxon period the number of grave goods dwindled, perhaps due to pressure from the Christian church or maybe more prosaic reasons, such as inheritance and trade becoming more commonplace. Estimating from the number of swords found in graves, only a small number of warriors owned a sword (most had to make do with a spear). However, the sword remained the symbol of the successful warrior. It was what all young men would aspire to own. Lords would gift swords to their most trusted warriors and blades were given names. They were the ultimate Dark Ages status symbol. Nowadays, if someone wishes to show off at a dinner party they might mention what model of car they drive. If you met a Saxon warrior at a feast in a mead hall, he might boast of the quality of his sword’s blade and regale you with the tales of its exploits in battle. Warrior: Copyright Stephen Weatherly, used with permission. 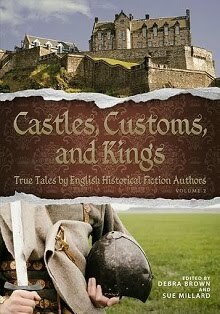 Matthew Harffy is the author of the Bernicia Chronicles, a series of novels set in seventh century Britain. The first of the series, The Serpent Sword, was published by Aria, an imprint of Head of Zeus on 1st June 2016. The sequel, The Cross and The Curse will be released on 1st August 2016. Book three, By Blood and Blade, is due for publication in January 2017. 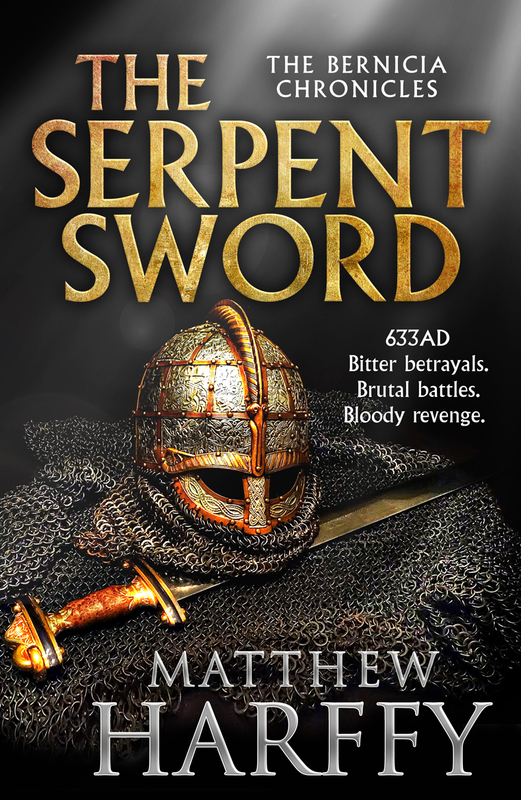 The Serpent Sword is available on Amazon, Kobo, Google Play, and all good online bookstores. 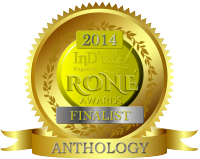 The Cross and the Curse is available for pre-order on Amazon and all good online bookstores. It is hard to really comprehend how valuable and coveted such items would be in a time when they were the absolute pinacle of technology. This was my kind of post Matthew! Thanks for writing it. I'm in love with pattern-welded swords - the beauty and artistry coupled with the time to make these blades is amazing. It's no small wonder Smiths were held in such high regard and their craft considered magical. Will be sharing! Thanks, Elaine! Glad you liked it. I fell in love with these blades too, which is why I had to buy the seax that appears in the photos above. It is truly beautiful. Hand forged by Paul Binns. So, what do you do with it? :-) Is it kept in a display cabinet or taken along to historical re-enactments or what? At the moment it's in a drawer! I need to work out how to display it where the kids can't get hold of it (it's sharp and heavy!). Thank you, Geoffrey. It is a fascinating period. Dark and mysterious in so many ways, but with real glimpses of light in some of the archaeological finds from the era. I would love to visit Whitby Abbey. 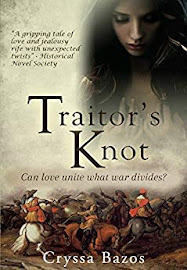 I hope you enjoy the book, and I also recommend Nicola Griffith's great book, Hild, and Edoardo Albert's Northumbrian Kings trilogy if you like the period and the area. Thank you, Anne. I love the imagery of period. Flickering flames licking the patterned blades of warriors who sit in great smoky halls boasting of their exploits in the shieldwall. I would not have liked to live then, but it is a great period in which to tell stories. Who Stole Britain’s Sixth Century?